Virtual reality and 4K displays, coupled with ever more powerful processors and graphic chipsets will see gaming take a huge leap forward, and Intel wants to be at the forefront of the scene. Gaming will generate $92 billion in revenue in 2015. Some $34 billion of it spent on PC games, but this could climb to $45 billion if you also include mobile. There are 1.8 billion gamers in the world, of which 1.2 billion are PC gamers. Of all these, 711 million are “active” meaning they played a video game at least once last month. The average age of an American gamer is 35. E-gaming is growing fast – just like regular sports, professional video gaming events are exponentially growing both in money and influence. Consider 205 million people around the world enjoy watching other people play video games. As the event’s theme suggests, gaming today is expanding and moving past some of its traditional barriers. Intel wants to be there when this happens by providing the right tech for the job. 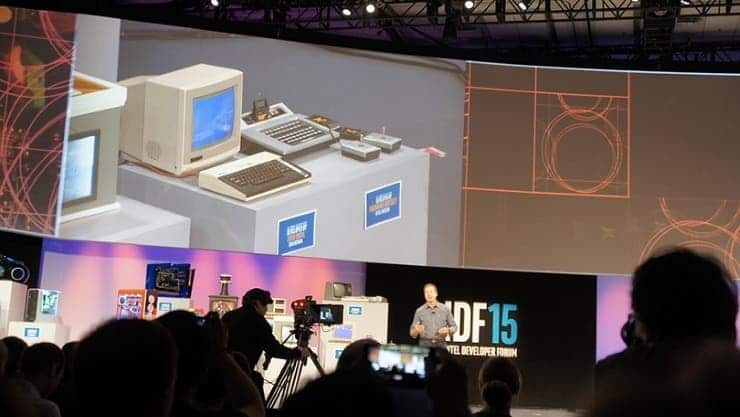 Besides cross-platform compatibility, Intel announced some of its gaming-related projects like the new Iris graphics system, which “can now outperform more than 80 percent” of discrete graphics solutions in the world. Combine that with the new “Skylake” processor family and you end up with a pretty killer combination. For instance, on stage, Intel engineers demonstrate how a Core i7-6700K can be overclocked to 6,998.88MHz (7Ghz). There was quite a bit liquid nitrogen involved. Besides hardware, Intel also touched on some of the software it’s beginning to roll out for gaming applications. Of note is the RealSense camera which you can use to scan your head, then use the 3D graphic as the face and skull of the leading character in your favorite video game. And it’s not just for video games, the RealSense camera can be used to create virtual environments with your phone. For instance, Lego’s marketing director, David Graham, showed how he scanned some Lego bricks on a table with his phone, then completely immersed himself in a virtual Lego environment that mimicked what he scanned earlier, walking around as a Lego person – yellow and disposed of opposable thumbs. Expect gaming to transform significantly in the coming years, blurring the line between real and virtual even further.